GestureTek has created interactive and immersive programming content for TV news channels, animated productions and game shows worldwide, such as Nickelodeon's ‘Nick Arcade’, Tokyo Broadcast System’s ‘Varikin 7’ and Weather Service International’s weather reports. We help identify and execute on interactive requirements, creating state-of-the art interactive ‘virtual sets’ and outputting broadcast-ready entertainment. TV programs using Gesture Xtreme System have enjoyed enthusiastic audience appeal. Nickelodeon, the children's television network used GestureXtreme to immerse players in their television program. WSI licensed GestureTek technology to turn their state-of-the-art weather presentation systems into interactive virtual sets. The company put the renowned, patented GestureTek Inc. “video gesture control technology” to work when they installed a custom 10 screen display in their atrium at Corporate Headquarters in Atlanta. 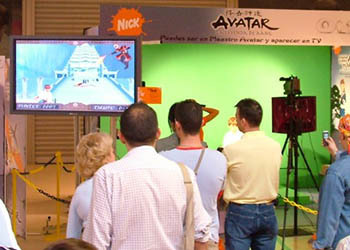 GestureTek created a game based on a popular animated series on television in Spain.